As I keep so many projects going at one time, I thought it might be rewarding to lay out my current crop of drawings-in-progress and review them together. The photograph above juxtaposes two shots in order to encompass the nineteen works that were arranged on the tabletop. All are in various stages of execution. Some have been in process for many years. Others are recently begun. Some will take only months to finish while others will take years. Others may never be finished. Some may be erased and the pages resurrected as grounds for other images. In the foreground of the photographs are examples from my Pages series. These drawings are created in the format of pages from my journal, 4 by 6 inches, but are created as independent drawings. Most are temporarily adhered to mat board using double stick tape (3M #415). The mounting keeps the works flat while I lay multiple watercolor washes into the page. I remove the mounting after the work is completed. The tape on the back of the drawing can usually be peeled away from the drawing with a sharp knife, like an Xacto. Any residue from the double stick tape can be removed with a rubber cement pickup. This process works best for small drawings; substantially larger sheets tend to buckle and can’t be efficiently held down in this manner. At center left of the photograph on the right is one of my Self-Portrait with Night drawings in a fairly late stage of development. Two other works from the Self-Portrait with Night series in relatively early stages are at upper left in the left photograph. At center of the right photograph are two landscapes called Dream Panels; the left one is entitled Summer and the right one is Spring. There is not enough detail in the shots to show the bands of writing that run through the images of both of these works but a closer view of Spring Twilight is here. Two sketches in graphite that have been executed on watercolor blocks are on the right side of the left photo. 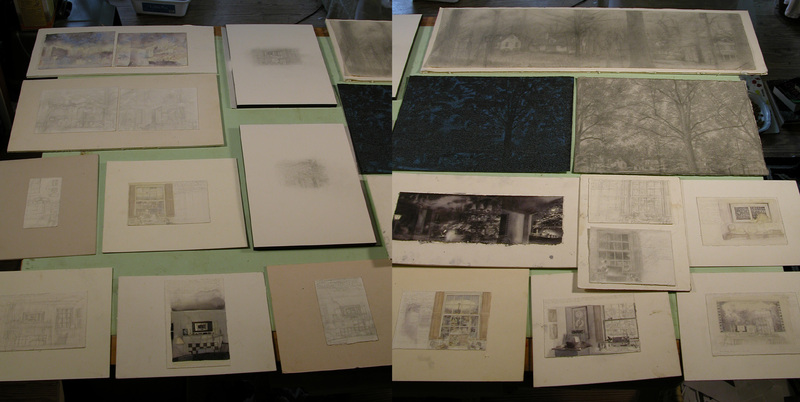 In the upper right of the photo on the right is a graphite drawing I began around 1985. I am still slowly working this one. Who knows if it will ever be finished? It seems to me to be more about the path than the destination. One of the great advantages of simultaneously working with so many pieces is forgetting. Works like these are kept in piles. After disappearing into stacks of work, I often recover the drawings to see them with fresh eyes and am able to bring to them new abilities that were honed during the intervening period. My prejudices drop away. I begin again. Note: The group of work shown in the photo excludes a number of works in progress: my current journal, other lesser used notebooks, all prints and related studies, and my winter drawings-in-progress. Only my summer group is shown above.